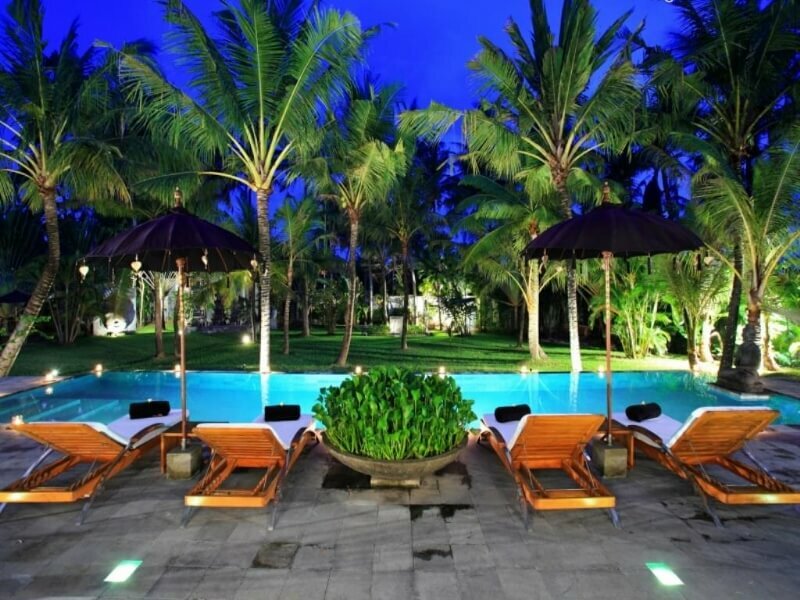 As a family we love to stay in Canggu and we often get asked what is the best family friendly Canggu Bali Villas? There are so many villas to chose from that it can seem impossible to chose one! 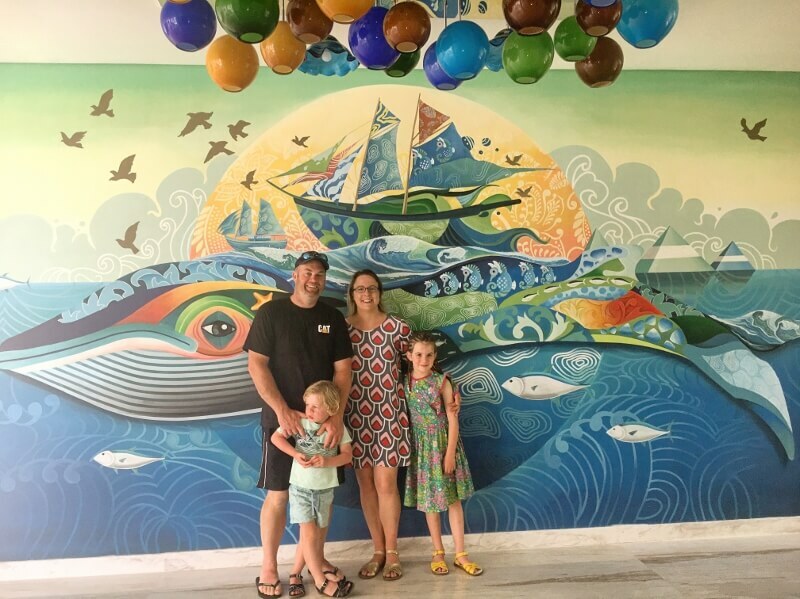 Staying in Canggu with kids is a great choice as there are a huge amount of family friendly restaurants and activities to do. Our post on things to do in Bali with kids under 5 years has many ideas that happen to be in Canggu. Also if you are keen on a day out at a Canggu water park, check out our post of our review of Splash Water Park at Finns Recreation Club and this is a great article of things to do in Canggu. Canggu is quite spread out and covers a huge area. As you can see on the Canggu map below, it can be confusing where Canggu starts and stops. I will use a few areas to give a general idea of where the villas are. There are more villas outside this area but for my own sanity of choosing which ones to add, I have kept it to the main tourist areas! These 2 villas are absolutely stunning and we can’t wait to stay in Villa Joju in October for Charlotte’s birthday. Located inland off Jl Pantai Berawa these villas are close to Finns Recreation Club and VIP access to Splash Waterpark is included for your stay! 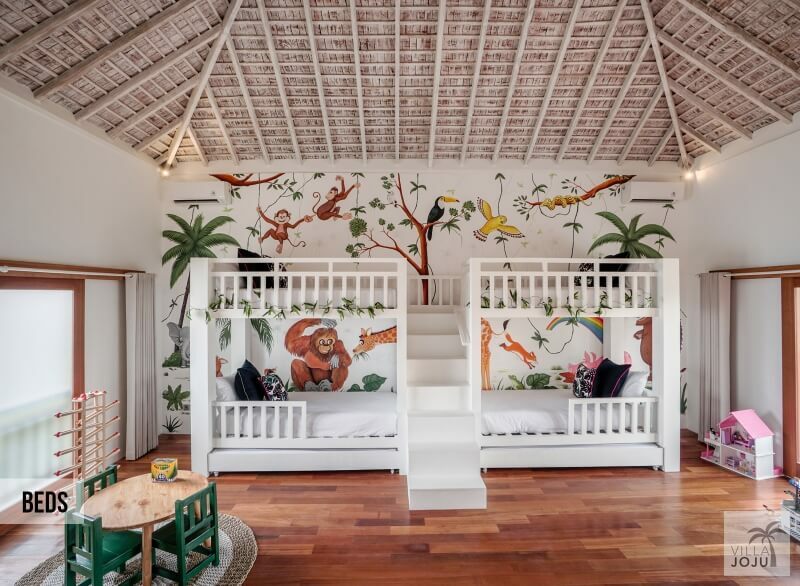 Villa Joju is a 5 bedroom villa + media room with a gorgeous kids bunk bed room. So many kid friendly inclusions including a pool fence that can be erected and bouncy castle! Next door Villa Joju Alit is a 4 bedroom villa that can be joined to Villa Joju to sleep 22 + infants. 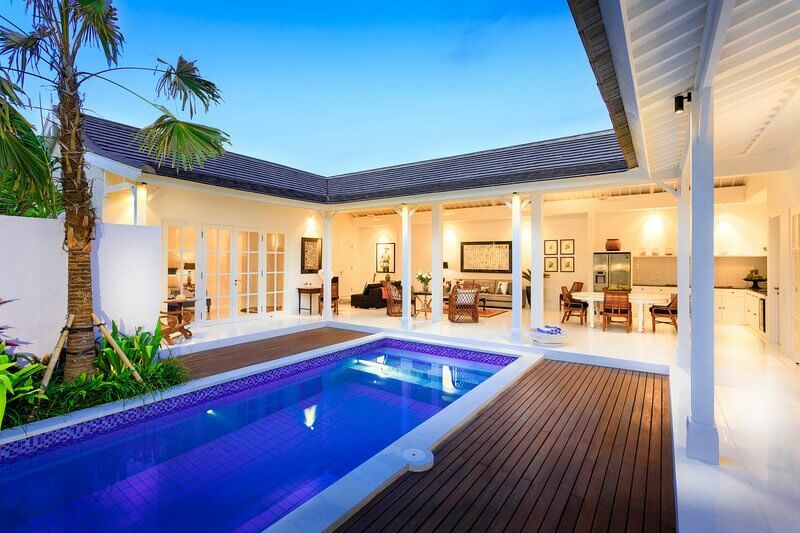 A gorgeous villa that once again can have a pool fence erected and pool toys on request. 3 bedroom villa located close to Splash water park and the villa comes with Platinum membership to Finns Recreation Club. Enclosed air conditioned lounge room and pool is able to be fenced. 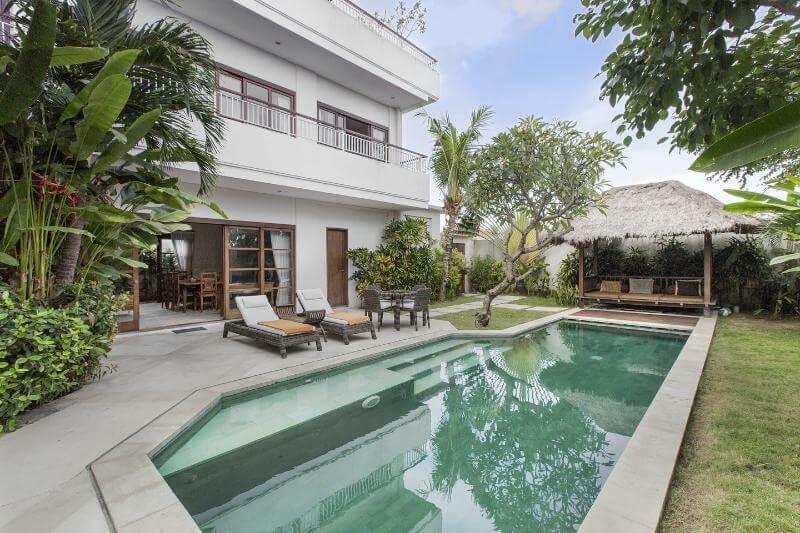 The bedrooms don’t interconnect but a great kid friendly villa in Canggu. We can’t wait to stay in this gorgeous villa in October with the kids. 2.5 bedroom villa located close to Pererenan Beach just north of Echo Beach. Not super close to everything but a lovely villa. It has 2 main bedrooms with a kids bunk room too. The 2 villas have an interconnecting door making it into a 4 bedroom villa each with a kids bedroom. The living area is open but the pool can be fenced. 3 bedroom located inland from Batu Bolong Beach. In a good location with access to many food options. The villa is 2 story with secure balconies. 2 bedrooms are downstairs but the bedrooms don’t interconnect. The living room and kitchen are fully enclosed and air conditioned. Upstairs is a large master bedroom, pool table and small TV room. The TV room could perhaps suit a portacot. 2 bedrooms located not far from Berawa Beach. This single level villa has an open living room but includes a media room for the kids to chill out. The bedrooms are not interconnected but the pool could have a pool fence erected. 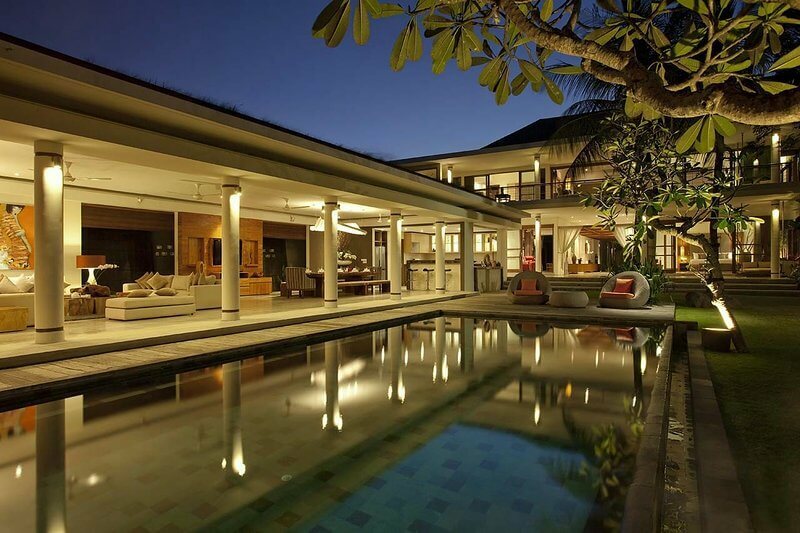 4 bedrooms located not far from Berawa Beach. Set over 2 levels with an open living room, there is an enclosed media room for the kids to chill out. 3 bedroom villa rated extremely highly on Airbnb and Tripadvisor. Located 800m inland from Echo Beach, it includes an air conditioned enclosed living area and a pool that is easily fenced. The bedrooms aren’t interconnected and the front entrance does have a pond but could be fenced off too. 3 bedroom villa located not far from Berawa Beach. 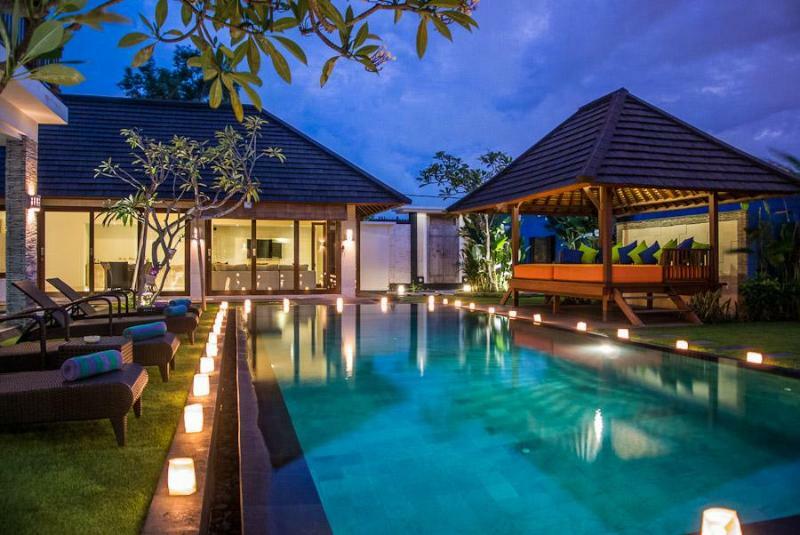 This villa has an open living area but is all on one level with a pool that can be fenced. None of the beds interconnect. 3 bedrooms located in a great location not far from Splash Waterpark, this is one of 12 villas in a secure compound. The living area is open plan with 2 bedrooms downstairs, these do not interconnect, and a huge bedroom with 2 queen sized beds plus lounge suite upstairs. 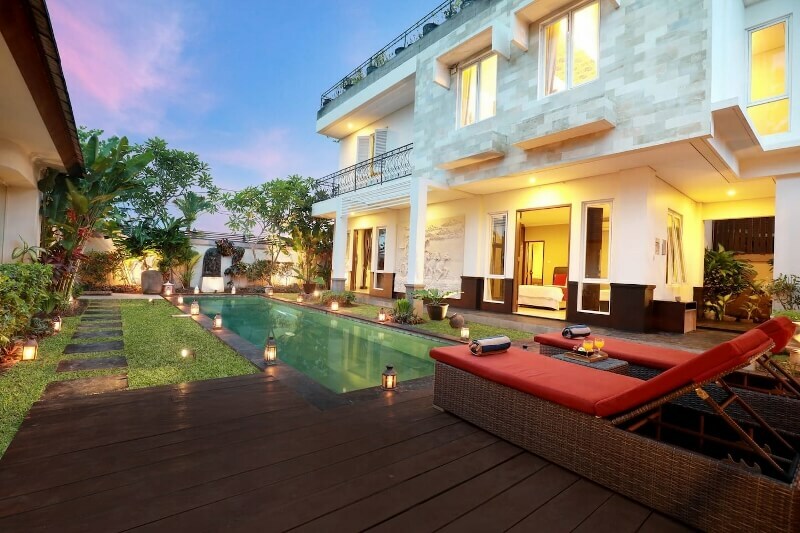 3 bedroom villa close to Berawa Beach, this 2 story villa has an enclosed living area that 1 bedroom connects off. In the same building is the room upstairs with a separate bedroom which would be perfect for grandparents. 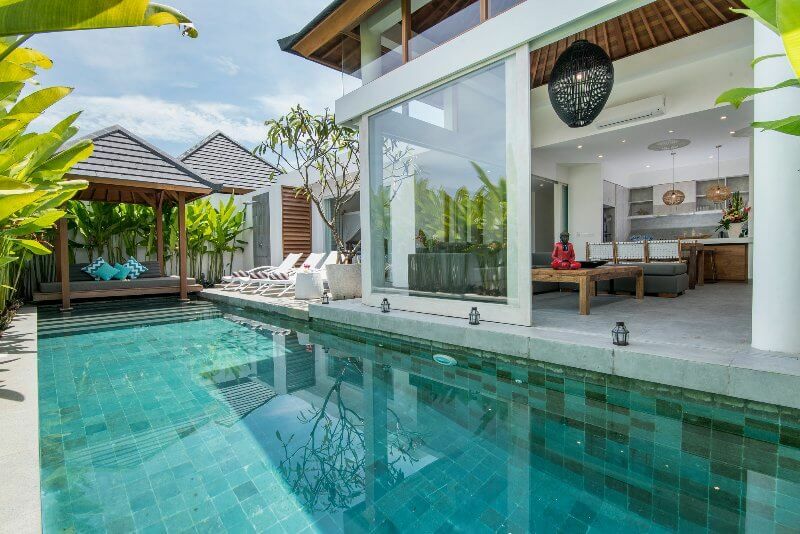 2 bedroom villa close to Berawa Beach, this modern villa has an enclosed living area with air conditioning but the bedrooms aren’t interconnected to this space. All on one level check out recent reviews as there is currently construction happening next door. 4 bedroom villa is so family friendly and located inland from Berawa Beach and close to a few of our favourites including Garden Kids Club. 2 of the bedrooms are interconnecting and there is also a playground with a slide, sandpit, cubby house and climbing wall. A pool fence can be arranged and living area is full enclosed with AC. 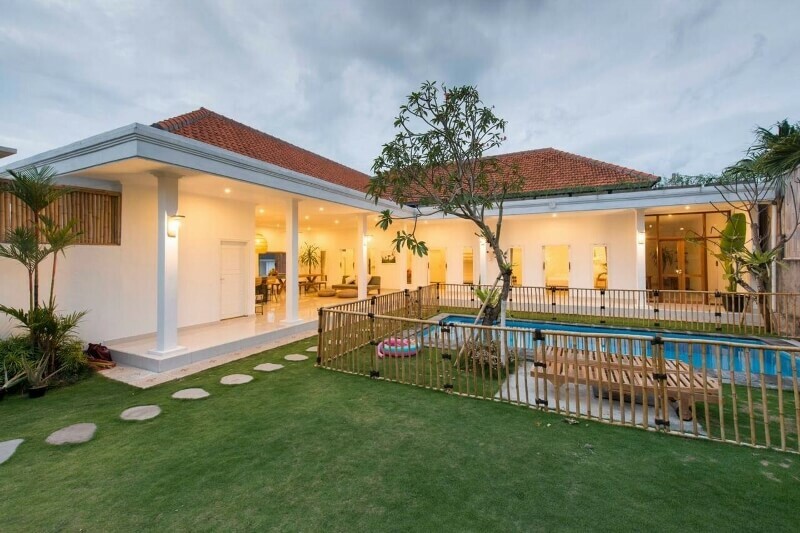 3 bedrooms this villa is located inland from Berawa Beach. The living area is enclosed but only has a fan for cooling. The bedrooms don’t interconnect. 1 or 2 bedroom apartments and 2 or 3 bedroom villas. This complex has a range of villa and rooms close to Echo Beach. The villa bedrooms don’t interconnect but is all on one level and a pool that can be fenced. 4 bedrooms and located inland from Berawa Beach is great spot. The villa is set over 3 levels and has an enclosed AC living area. This is a huge villa that looks amazing if stairs don’t bother you. 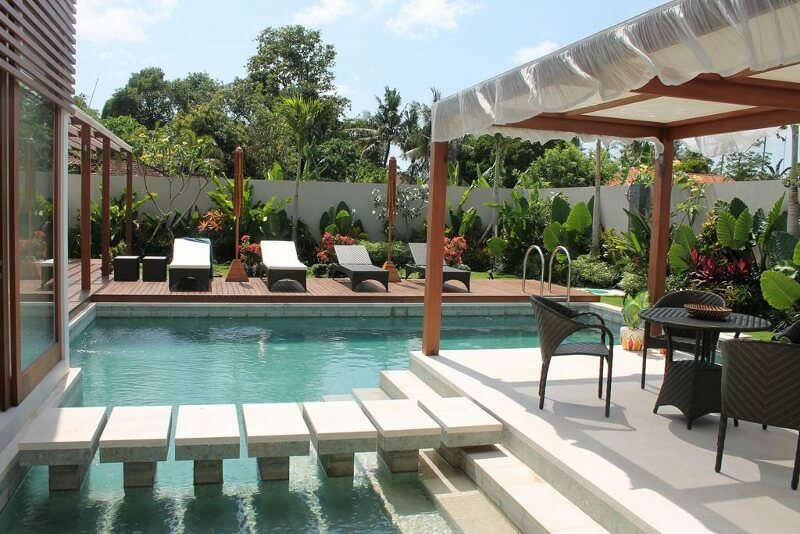 3 bedroom villa located close to Berawa Beach. There is a separate AC living room and the bedrooms are over 2 levels but with multiple beds. 3 bedrooms located close to Finns Recreation Club. There is a enclosed AC living area that has 1 bedroom connected to this. The other 2 bedrooms are around the pool and all on 1 level. 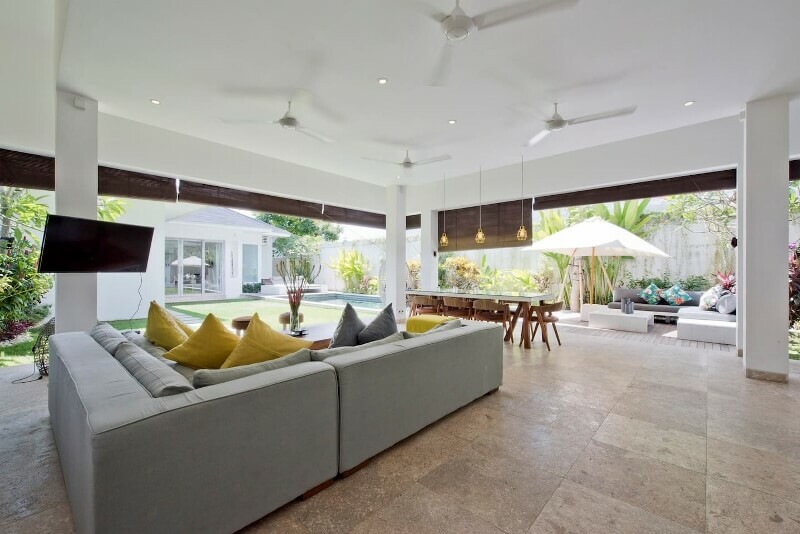 3 bedroom villa located close to Berawa Beach. Set over one level the lounge room is open but the pool can be fenced. Love the decor on this villa. 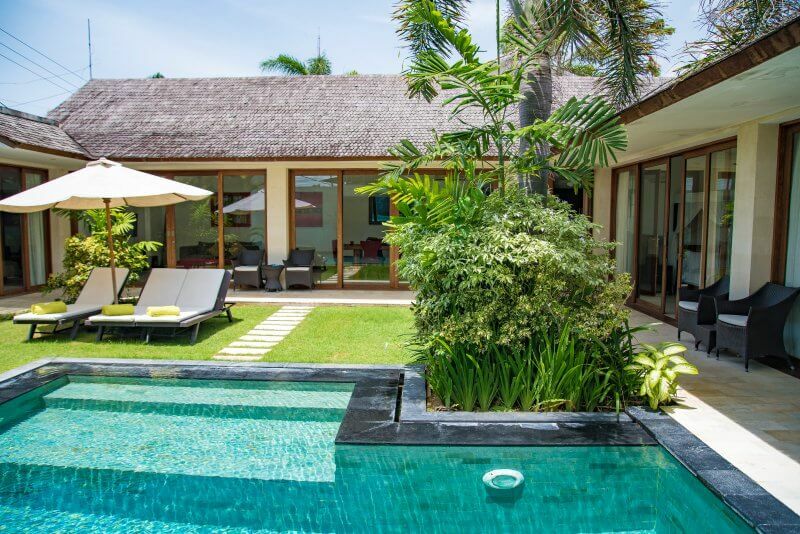 3 bedroom villa located not far from Batu Bolong Beach. This villa is set over 2 levels with a huge amount of space for the kids to run around. 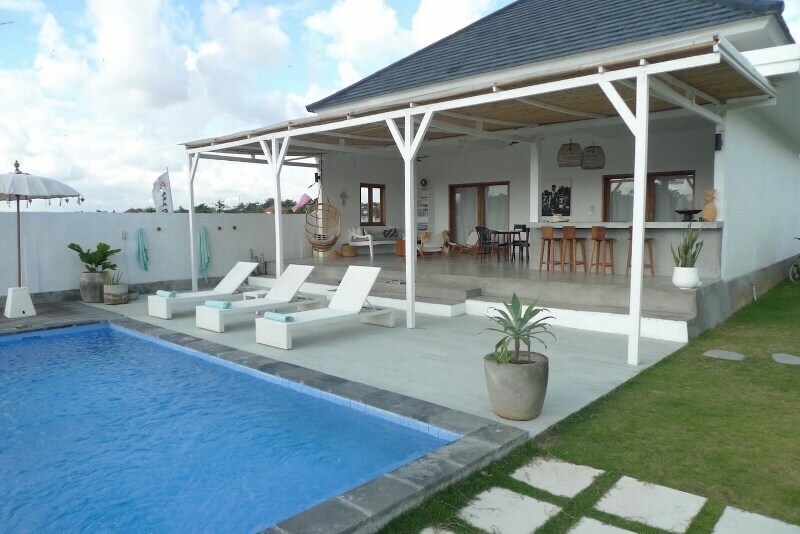 4 bedroom villa located inland from Berawa beach and close to Bali Equestrian Centre that we love! The bedrooms both downstairs and upstairs are interconnected with 4 bunk beds in the ground floor bedroom. The living area is open but there is also a media room with AC if the kids need to chill out and watch a movie from the Bali heat. 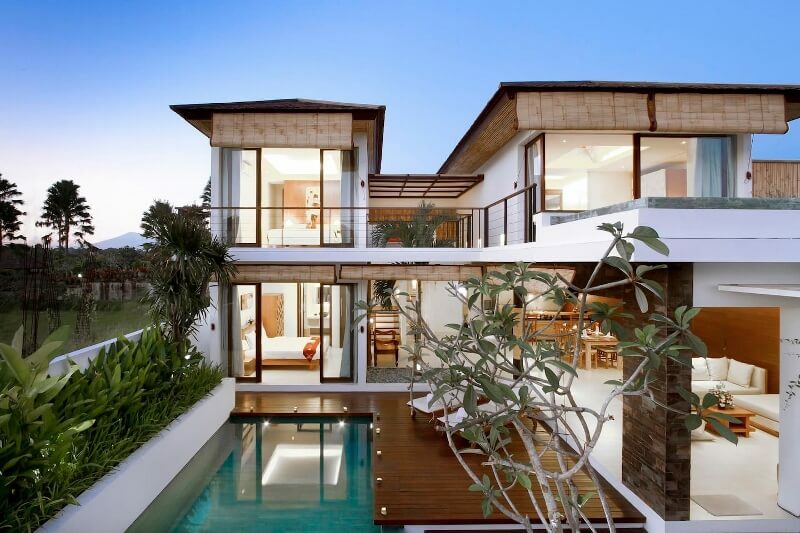 3 bedroom villas located close to Batu Bolong Beach. 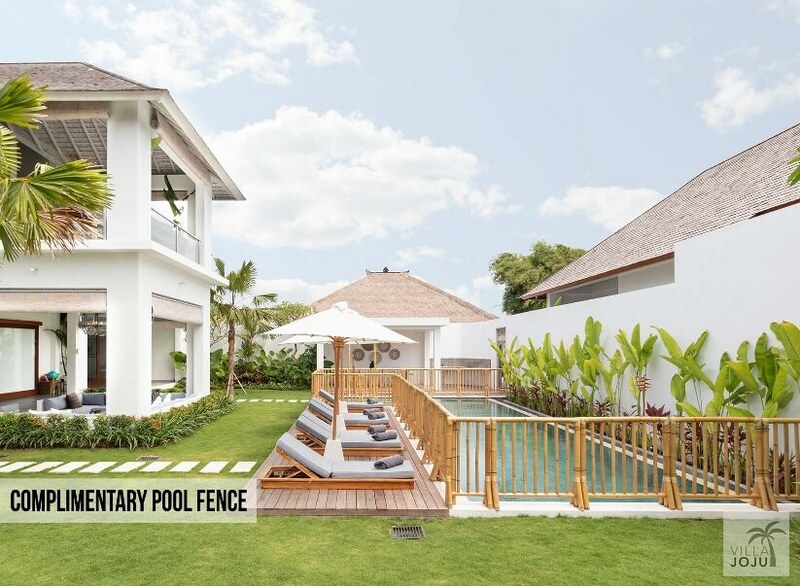 A great family friendly feature of these villas is the permanent glass pool fence. 1 bedroom is downstairs and 2 bedrooms with a media room are upstairs. 2 of the villas also interconnect making it 6 bedroom and there is also a 3rd villa so 9 bedrooms all up. 4 bedroom villa is in a great location close to Splash Waterpark at Finns Recreation Club. The lounge area by the pool is open but there is an AC cinema room. 2 bedrooms are on each level. 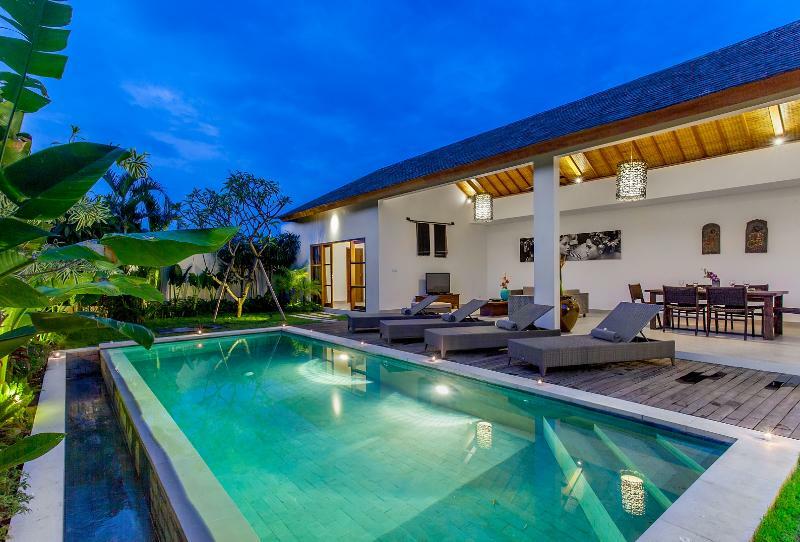 3 bedroom villa located close to Batu Bolong Beach. 2 bedrooms upstairs and 1 downstairs, this villa comes with a pool fence that is included in the price! A family friendly villa with plenty of space. 2 bedroom villa located inland from Echo Beach. All on one level, there is so much space for the kids to run around. 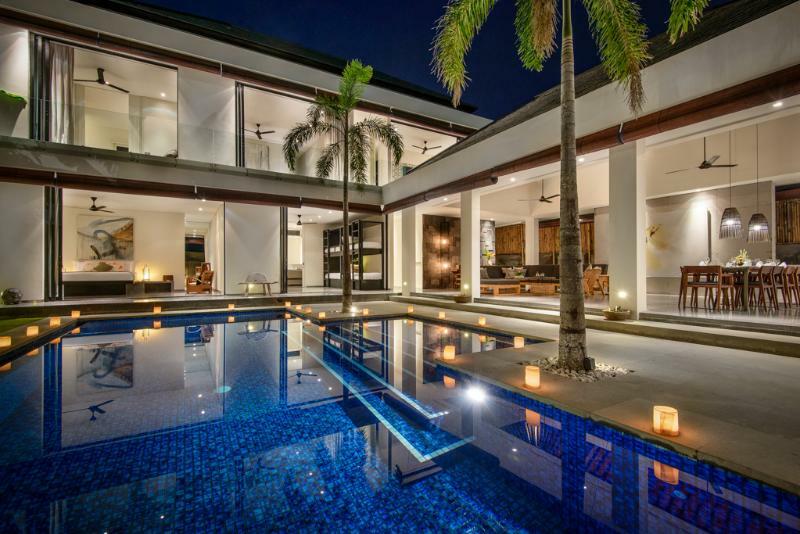 The living area is open plan but the pool can be fenced. 7 bedrooms: a main 4 bedroom villa, a 2 bedroom villa and a 1 bedroom with an enclosed AC living area. The 3 different villas can be booked separately or all together. Located close to La Laguna and not far from Batu Belig. 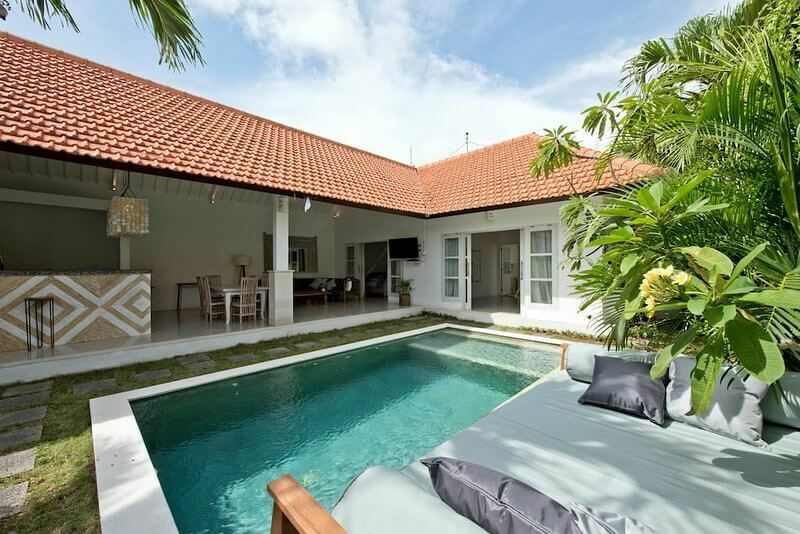 2 bedroom villa is located close to Batu Bolong Beach. 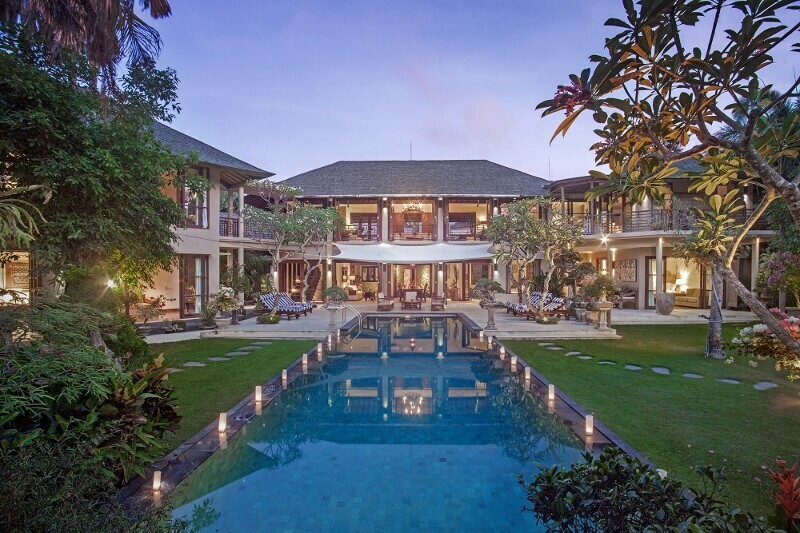 It has a huge enclosed AC living space and can be combined with Villa Canggu South to make 6 bedroom villa. 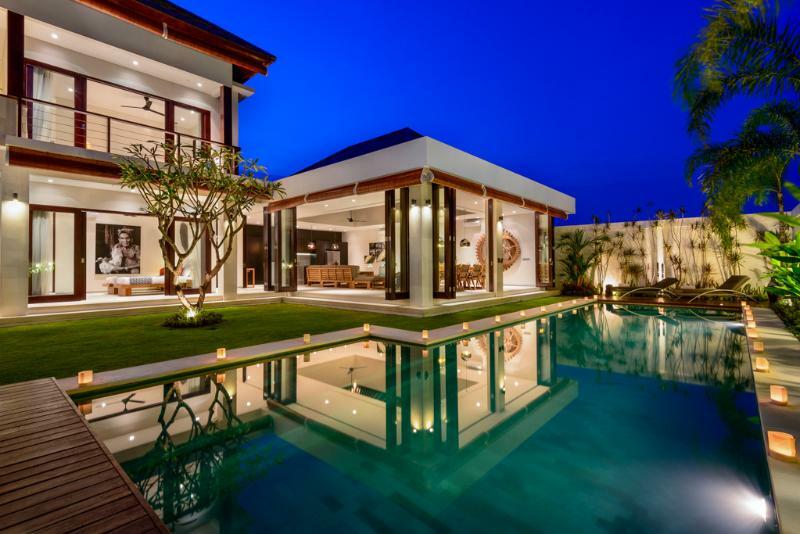 Villa Canggu South has 4 bedrooms and can also be rented separately but may not be suitable with the outside stairs and toddlers. With older kids would be great! 2 bedroom villas located between Batu Belig and Splash Water Park. 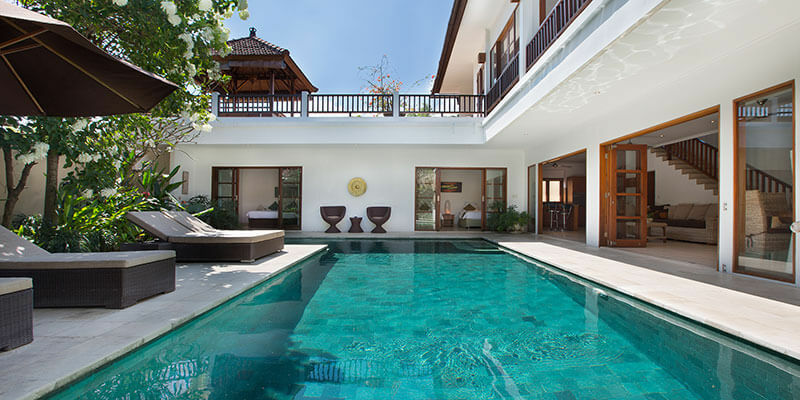 They have a range of different villas and Bima, Yudhistira, Nakula and Sadewa appear to be the best suited to families. The villas are on 1 level and some villas have an AC dining and kitchen area that is enclosed. Some of the villas also have bedrooms and dining area enclosed too which would make them suitable with adventurous toddlers. 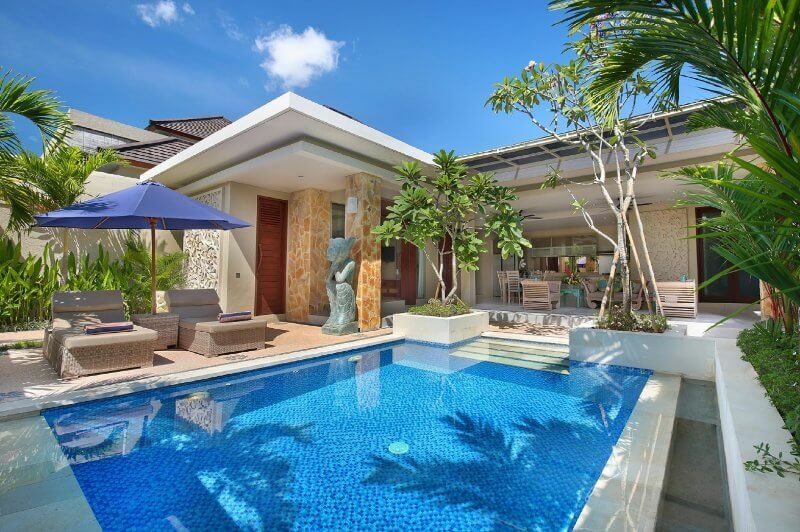 4 bedroom villa located a short distance from Berawa Beach. All the bedrooms are downstairs and the upstairs bedrooms on the floor plan aren’t for rent so the top area is locked off. The bedrooms aren’t interconnected but the living area is enclosed with AC. 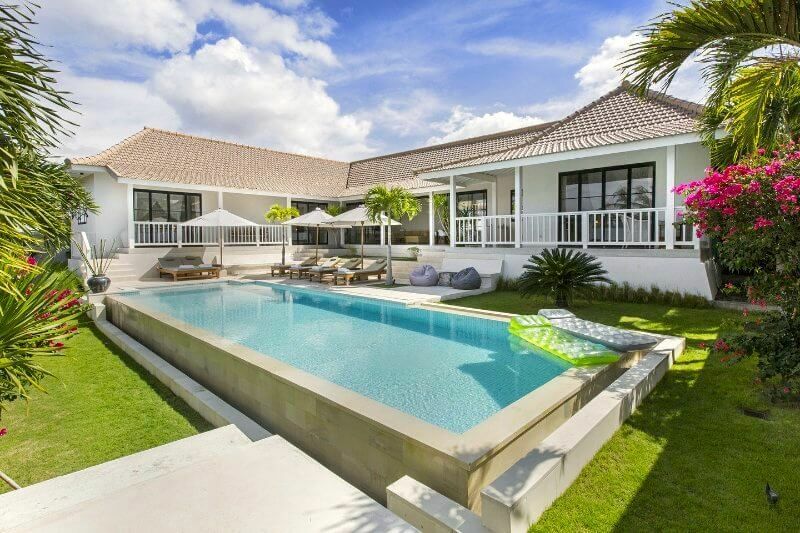 4 bedroom villa located close to Bali Equestrian Centre inland from Berawa Beach. There is plenty of space for the kids to run around and the living space can be enclosed with AC. 2 bedrooms upstairs and downstairs that don’t interconnect so more suitable to older kids or babies. 5 bedroom villa located close to Finns Recreation Club this spread out villa has gorgeous gardens for the kids to run around. Worth checking out if you need some space. 5 bedrooms located near Batu Bolong Beach. This villa is huge and is set over a couple of levels so pool fence and stair gates would need to be hired with toddlers. 2 bedroom villa located not far from the beach north of Echo Beach. The lounge, kitchen and bedroom areas can be fully enclosed from the pool. A great value villa that comes highly recommended. 3 bedroom villa located inland from Echo Beach. This is a fantastic family friendly villa including a pool fence and many other kid friendly aspects. The master bedroom interconnects with the kids room which I love so much. Unfortunately no availability left for 2018. 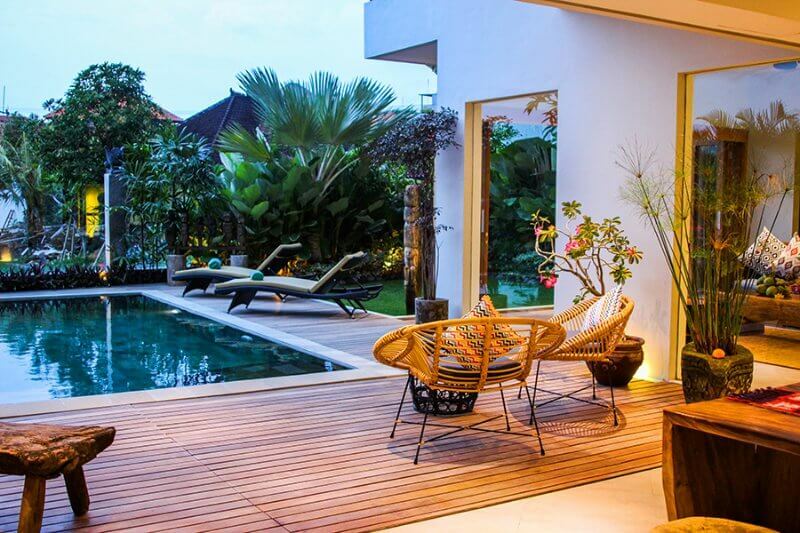 We hope this list of Canggu Bali accommodation helps with planning your best family holiday to Bali. 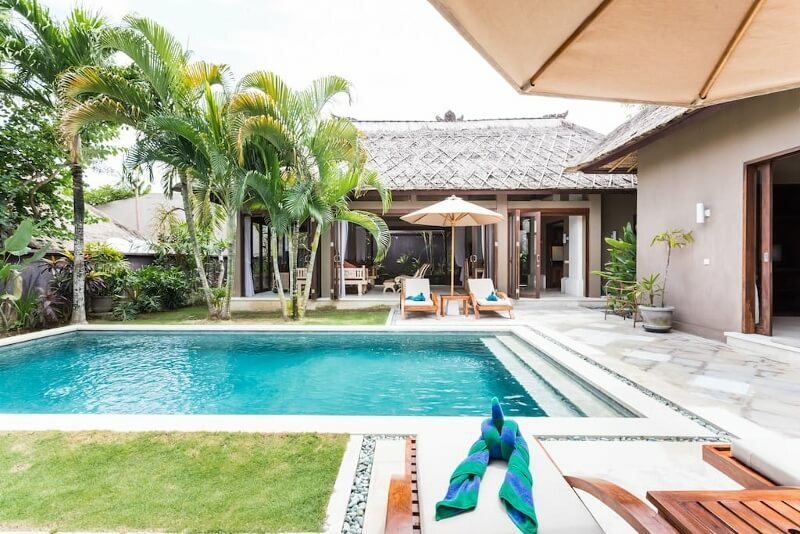 If you know of any fantastic family friendly Canggu villas please let us know. You can find us on Facebook, Instagram or Pinterest. We love to help and if you would like to join our closed Facebook group find the link here. 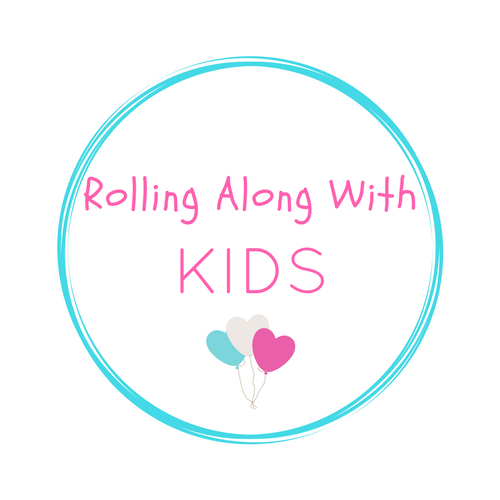 We have nearly 1000 members that love to help out and I am in there to providing lots of extra tips on travel to Bali with kids. Also coming soon is our Ultimate Guide to Canggu with Kids. In this post we will detail all the best places to eat, play and stay with kids in Canggu. Feel free to send any suggestions through to me on email. Disclaimer: This post contains affiliate links and if you click on these links and purchase any products we will receive a small commission at no extra cost to you. This helps to keep our blog going and that we can continue to provide you with lots of new information on travel to Bali with kids. Thanks for your support.